Forget argan, coconut, or avocado oil. 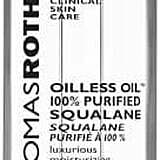 Squalane oil is the skincare ingredient that will really transform your skin and your hair. Squalane (a stable form of the similarly named squalene) is commonly derived either from shark livers or plants. These days, squalane in skincare is almost always plant-derived, but always check the packaging to be sure. Squalane is a magical skincare ingredient because the same oil is naturally produced in the body, so using it helps maintain the body's natural oil levels when we age. Here's exactly how squalane can benefit your skin. Once you're convinced to give it a go, shop some of our recommendations at the end. The oil is noncomedegenic, meaning it is among the oils least likely to clog your pores. So if you have blemish-prone skin, don't worry about it being too heavy. So many people hate oils because they leave a thick residue and don't absorb well. Squalane absorbs at a rapid rate into the skin and doesn't leave a greasy feeling. As I said above, as the oil is noncomedogenic it's suitable for all skin types. 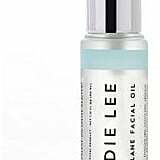 This versatile oil can be used for those with dry skin, ageing concerns, and even acne. Although squalane can be used everyday, I like to use it as an extra moisturiser or serum when my skin is feeling particularly dry. It may feel lightweight, but it packs a punch when it comes to skin hydration. If you have particularly dry patches, eczema, or other skin conditions, squalane is great at soothing and regenerating the skin. The oil is nonirritating so you don't get the same side effects you might from a prescribed cream. Yep, it even helps protect against environmental factors and free radicals. 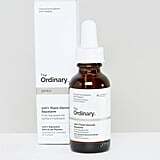 This can reduce pigmentation in the skin, signs of ageing, and decreased skin cell renewal. That doesn't mean it's a replacement for sunscreen, though. Always use an SPF! I even use squalane at the ends of my hair. I find it helps control split ends and gives my hair a healthy shine.